For some newcomers to the Pacific Northwest, it’s only a matter of unpacking boxes before they feel “home.” For others, it’s that first long hike, knowing how to pronounce Puyallup and Sequim or finding a local tavern with decent draft beer and some personality. 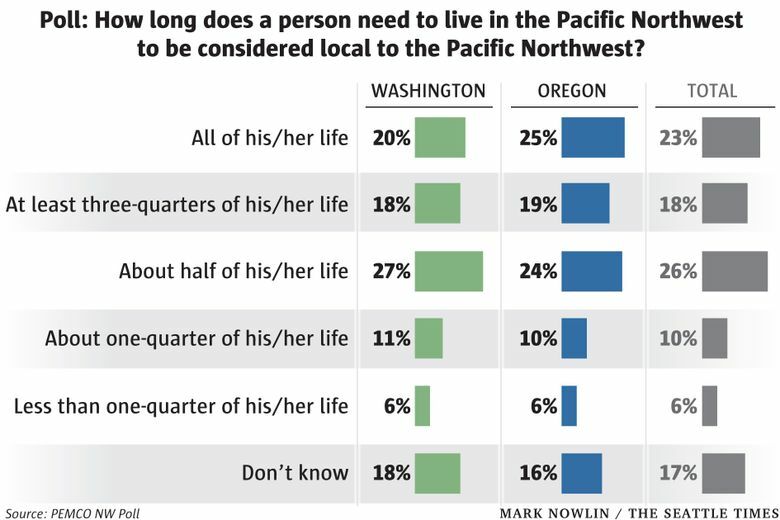 Earlier this year, 1,200 residents of Washington and Oregon were asked by FBK Research of Seattle how long they think a person must live in this area to be considered a “local.” Nearly one-quarter of those polled said they believe a person must live here their entire life — yeah, you read that right — to be included in this circumscribed group. Related video: Can you say Skamoka-WHAT? Others are not as strict: About 18 percent of respondents said the minimum requirement for local status is to have lived here at least three-quarters of their life, and about 26 percent said it takes living here half a lifetime to legitimately be called local. Few people, about 16 percent, said people can consider themselves locals after living here one-quarter, or less, of their lives. Interestingly, of those polled, 72 percent called themselves locals and 24 percent considered themselves transplants. The pollsters, however, did not appear to have investigated which definition applied to those those who claimed to be local. But there appears to be at least one thing most of those polled agree on: They feel they’re “home,” whether anyone else agrees or not. Almost two-thirds of respondents say they aren’t very likely or not at all likely to leave the region. Whether “local” or not, it seems people are here to stay.